On Sale Now! 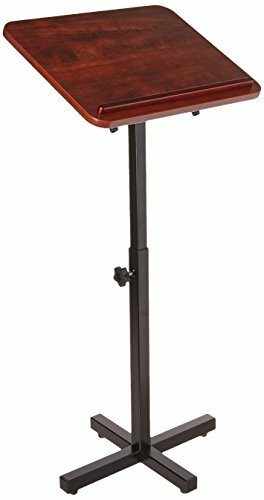 Save 5% on the Lorell LLR69868 Metal Frame Lectern by Lorell at Momiji Studios. MPN: LLR69868. Hurry! Limited time offer. Offer valid only while supplies last. Floor lectern offers a versatile presentation tool for professional speakers. Frame adjusts in height from 38'' to 48-7/8'' high to suit the speaker. Floor lectern offers a versatile presentation tool for professional speakers. Frame adjusts in height from 38" to 48-7/8" high to suit the speaker. Platform tilts from 0 to 70 degrees for the most comfortable viewing angle of notes and other essential documents. Platform also features a Cherry laminate top with a brown plastic ledge to keep presentation materials in place. Adjustable frame is made of metal with a powder-coated finish of durability.